A link to the fascinating mystery. Courtesy of NASA (JPL P30570B/GPN-2000-001500). Kármán, Theodore von (11 May 1881-7 May 1963), aeronautical engineer, was born in Budapest, Hungary, the son of Maurice (Mór in Hungarian) Kármán, a professor, and Helen Kohn. In Hungarian the boy’s name was von Sköllöskislaki Kármán Todor. For a few years he was tutored at home by a former student of his father, and through his school years he was almost totally dominated by his father’s strictures. When Kármán was six, his older brothers found that he could multiply large numbers in his head, but his father considered this a show-off ability only and forbade all mathematics for several years, and instead encouraged him in geography, history, and literature. In 1890 Kármán entered the Minta Gymnasium, established by his father for elite students. In his final year there, 1897, Kármán won a national contest, the Eötvös prize for the most outstanding student in science or mathematics. Kármán’s father had a nervous breakdown at that time, and so, as he had intended, Kármán entered the Palatine Joseph Polytechnic in Budapest, a technical school. There, at his father’s urging, he chose the engineering course instead of science or mathematics. Encouraged by a professor of engineering and hydraulics, Donat Banki, Kármán investigated the problem of clatter in engine valves and predicted the necessary mechanical modifications to prevent it. Kármán received a B.S. degree in mechanical engineering in 1902, with a thesis “The Motion of a Heavy Rod Supported on Its Rounded End by a Horizontal Plane” (actually a child’s toy). After a year of compulsory military service in the Austro-Hungarian artillery, he became assistant professor of hydraulics at Palatine Joseph Polytechnic. He also joined Banki as a consultant for Ganz and Company in Germany, a manufacturer of locomotive engines. He pursued research in combustion, fluid motion, and compression. Widely noted by engineers was his 1906 paper, “The Theory of Buckling and Compression Tests on Long Slender Columns,” which was applicable in machinery, bridges, buildings, and aircraft. In 1906 Kármán received a fellowship from the Hungarian Academy of Sciences and chose to study at the University of Göttingen in Germany, where his professors included Felix Klein in applied mechanics, Ludwig Prandtl in fluid mechanics, and mathematician David Hilbert. Using a large hydraulic press donated by arms manufacturer Alfried Krupp, Kármán determined the nature of buckling in columns of large structures and derived the associated mathematical equations. He received a Ph.D. in engineering in 1908, with a dissertation on this subject. While visiting Paris in March 1908, Kármán observed a short flight by Henry Farman in a test airplane (five years after the Wright brothers’ flight in the United States), and his curiosity was drawn to the physical principles of flying machines, which led to his lifetime involvement in aerodynamics. He accepted a position in the fall of 1908 as laboratory assistant at the University of Göttingen, where an airship wind tunnel was under construction for the Zeppelin Company, directed by Prandtl. Kármán analyzed the flow of fluid past a cylindrical obstacle at right angle and determined that the wake separated into two rows that create vibrations, as in aircraft wing flutter and a bridge in high wind. 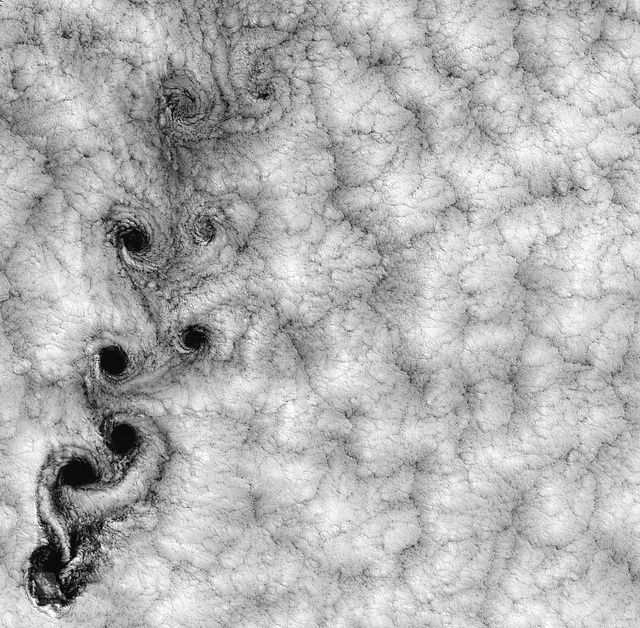 The concept, presented by him in several papers in 1911 and 1912, came to be called Kármán vortex street or Kármán vortices. It led to the redesign of many structures to withstand oscillations and to modifications in the design of ships and aircraft to a streamlined shape. Also at Göttingen with physicist Max Born in 1912 he devised a three-dimensional mathematical model of vibrating atoms, which came to be accepted as illustrating atomic structure in solid matter and was later useful in studies of materials at very low temperatures. Believing that he could not advance to a senior position at Göttingen, in 1912 Kármán became professor of applied mechanics at the College of Mining Engineering in Selmeszbánya, Hungary, but he found it lacking in equipment and scholarly ability, and so he left it after a few weeks. In February 1913 he became professor of aeronautics and mechanics at the Technical University in Aachen, Germany, and director of the Aachen Aerodynamics Institute. He promptly began improving the institute’s facilities, including the wind tunnel for testing aircraft, and he enlarged the teaching staff, which already included inventor and industrialist Hugo Junkers as professor of engines. Kármán began researches on aircraft design that led to changes in wing shape. His approach to engineering problems was through mathematical calculations, which were then tested in a laboratory, often by his students, for he was not mechanically adept. During World War I Kármán was called into military service in 1914 as a first lieutenant in the Austro-Hungarian Army and director of research in its aviation corps, for which he developed improvements in airplanes for military use and designed a helicopter with two counter-rotating propellers. At the end of the war, back in Hungary, he tried briefly to revise the country’s curriculum in the sciences, but he abandoned the effort because of political upheaval there and returned to his former position in Aachen in 1919. He obtained financial support for research from airplane manufacturer Hugo Junkers and from the von Zeppelin Company. With colleagues he carried out studies especially on the frictional resistance of fluids, including laminar flow and turbulence, as related to the shape and lift of airplanes. His institute became internationally known through its many publications and Kármán’s extensive lecturing in various countries, and it drew students from many places. With Johannes Martinue Burgers he published General Aerodynamic Theory (two volumes) in 1924. Kármán called for the first International Congress on Aerodynamics and Hydrodynamics in 1922 in Austria and the first International Congress of Applied Mechanics in 1924 in Holland. At the Holland meeting Kármán first met the head of the California Institute of Technology (Caltech), Robert Andrews Millikan, who in 1926 invited him to the United States for consultation on the design of a wind tunnel. Kármán recommended a closed air-circulation system, and the construction was supervised by Clark Millikan and Arthur L. Klein. The next year Millikan asked Kármán to head the newly established aeronautical laboratory at Caltech in Pasadena, California. After devoting some months to advising the Kawanishi Machinery Company in Kobe, Japan, on that country’s first wind tunnel, and other delays, from 1928 to 1929 Kármán spent half his time at Aachen and the other half at Pasadena. In 1930 he became full-time director of the Daniel Guggenheim Aeronautical Laboratory of Caltech. His decision to leave Germany was based partly on increased Nazi sentiment and anti-Jewish attitude there. His mother and his sister accompanied him to the United States. He became a U.S. citizen in 1936. According to Kármán’s biographer, Michael H. Gorn: “Millikan made clear to him just what Cal Tech expected from the Guggenheim Laboratory–a vehicle to draw the U.S. aviation industry to Southern California and to bring to the campus national preeminence in aeronautics” (The Universal Man, p. 56). The graduate department in aeronautics soon reached a high stature, in large part because of Kármán’s insistence on the use of mathematics in engineering problems and his personal involvement with each student’s project. Half a dozen West Coast aircraft companies availed themselves of the wind tunnel for testing models, aided by students. Among the results was the successful design of the Douglas commercial airplanes for passengers: the DC-1, DC-2, and the highly satisfactory DC-3, which began commercial service in 1935. Kármán contributed to the design, working with Arthur Klein, by determining that a fairing at the joining of the fuselage and upper wing reduced turbulence and that sheet metal with appropriate stiffening was a satisfactory replacement for the wood and fabric that had been commonly used in airplanes. Work on rockets began at the Caltech laboratory with graduate student Frank J. Malina in 1935, at first encouraged only slightly by Kármán, who was not certain that such a technology could be devised. Malina’s efforts in developing propulsion with liquid propellant had some successes and a few disasters, and the small group moved along to solid propellants. Kármán suggested the term jet propulsion, to avoid a general antipathy to rockets, which at the time were considered impossible. In 1938 the research group continued under the financial support of the U.S. Air Corps, strongly supported in its goals by General Henry H. Arnold. Kármán became closely involved in the physics and mathematics of the program, which in 1940 was called the Air Corps Jet Propulsion Research Project and was located (for safety from explosions) in a remote canyon outside Pasadena. In 1942 Kármán and five of the other scientists in the program formed Aerojet Engineering Corporation, to accept contracts for building jet engines. In 1943 General Tire and Rubber Company purchased half the stock in Aerojet, and Kármán continued as an adviser to the company. Other studies on rocket research continued at Caltech’s aeronautical laboratory under Kármán. After reports that German scientists might have successfully designed rockets for military use that flew as far as one hundred miles, U.S. Army Ordnance offered a $3 million contract to Caltech for one year to produce a projectile. The result was the establishment of the Jet Propulsion Laboratory by Caltech in November 1944, with Kármán as its director. Under the National Aeronautics and Space Administration since the late 1950s, it has continued as a major contributor to scientific work on rockets, supersonic flight, and the space program. In 1944 Kármán accepted a request from General Arnold to review the future air power of the United States as it would relate to rockets, guided missiles, and jet propulsion. He led U.S. scientists on two trips to Europe in February and April 1945 to inspect aircraft construction facilities and to interview the scientists who advised them in locations where fighting of World War II was over. The report by the group, Where We Stand, concluded that the supersonic aircraft could be built, that unmanned aerial devices and target-seeking missiles would come into use, and that pilots would have aerial communications that function under any conditions of visibility and weather. Kármán warned that atomic weapons that could be delivered over long distances would revolutionize future aerial warfare. He noted that jet engines would soon come into use for aircraft and that radar would have a much greater role in flight and in warfare. After a second trip to Europe with other scientists, Kármán wrote Science, the Key to Air Supremacy in 1945 for General Arnold, as one of the group’s eleven volumes under the title Toward New Horizons. Concerned with military needs, he spent most of his time in Washington, D.C., until 1951 and continued on the U.S. Air Force Scientific Advisory Board until 1954. In 1949 he resigned from the Guggenheim Aeronautical Laboratory and the Jet Propulsion Laboratory and became professor emeritus at Caltech. During the summers of 1957 and 1958, in Woods Hole, Massachusetts, he led a group of scientists in conferences to advise the air force on its future direction. Keenly interested in international exchange of scientific ideas, in 1951 Kármán organized a meeting of the North Atlantic Treaty Organization on means of strengthening common defense. This led to establishing the Advisory Group for Aeronautical Research and Development (AGARD), in Paris, of which Kármán was chairman until his death. Through its auspices he founded the Training Center for Experimental Aerodynamics (later named the Von Kármán Center). He helped found the International Council of the Aeronautical Sciences in 1958, which sponsors international congresses in that field. He was among those who created the Advanced Research Projects Agency of the Department of Defense. With M. A. Biot, Kármán wrote Mathematical Methods in Engineering (1940). His other books were Aerodynamics: Selected Topics in Light of Their Historical Development (1954) and, with Shih I. Pai, From Low-Speed Aerodynamics to Astronautics (1963). He wrote almost 200 articles. Among many honors, Kármán received the Medal for Merit in 1946 and the Franklin Gold Medal in 1948, and he was the first recipient of the National Medal of Science in 1963. Kármán never married. With his sister Josephine as his hostess for many years, he vastly enjoyed entertaining students, colleagues, and visitors. He died in Aachen, Germany, where he had gone to seek improved health in the hot springs.